See great examples of xeriscaped yards! Please use the resources on this site to transform your yard and your community’s landscape to protect our water resources. “Xeriscape” simply means landscaping with plants that do well in the local climate without requiring much, if any, additional water beyond normal rainfall. This can encompass a wide variety of plant options. It is important to note that xeriscaping does NOT mean landscaping with rocks and cacti alone. Though you may see other cities and organizations use other terms such as WaterWise (City of Austin), WaterSMART (US Bureau of Reclamation), WaterSaver (City of San Antonio), GreenSpace (EPA), drought-tolerant, drought-resistant, water-efficient, and so on, the concept is the same. All of these embrace the same call for minimizing water requirements by using native and adapted plants. The typical American lawn is a stylistic choice modeled after lawns in water-rich England and popularized in post WWII suburbs. Most turf grasses used in Texas are not native and not adapted to our climate, and require large water inputs to keep them 'green'. A typical single-family home can use up to 60% of its water use on outdoor irrigation. Texas’ water resources are stressed due to drought, population growth, and our changing climate. Texas is using water faster than rain can replenish it in our aquifers and lakes. The Texas Water Development Board projects municipal water demand to grow from 27% of total water demand currently to 38% by 2060, outstripping all other sectors. Outdoor lawn watering is a major driver of municipal demand. The Texas Water Development Board states that nearly $27 billion in state financial assistance will be needed to meet municipal demand by 2060. This does not count additional money that cities will need to spend on water treatment and distribution infrastructure. To save tax dollars and to protect this water for the future, we need to rethink our landscapes. Xeriscaping refers to drought tolerant landscapes with minimal water requirements. Optimally, a well planned xeriscape would require no additional water other than what is naturally occurring. However, new plantings need to be watered until they are established. Xeriscapes come in a wide variety of aesthetic preferences; to landscape water efficiently does not mean sacrificing beauty. Senate Bill198, passed by the Texas Legislature in June 2013, prevents homeowner associations (HOAs) from banning xeriscaping, as many now do. HOAs will still be able to lay down guidelines for landscapes and require prior approval to all changes in a landscape, but may not “unreasonably restrict' the ability of a homeowner to conserve water. The new law went into effect on September 1, 2013. 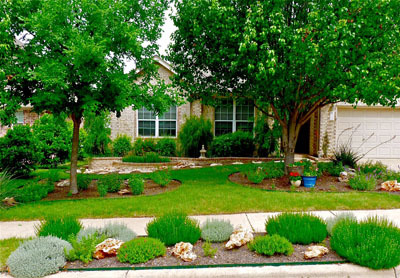 Express your interest in having a xeriscaped yard to your HOA. Invite Clean Water Fund to meet with your board or committee or to make a presentation on xeriscaping in your community. Review the sample xeriscape guidelines here. Adopt the guidelines in full or make changes based on your community's needs. Find landscape experts and master gardeners who may consult with the Architectural Review Committee on xeriscape designs. Hold a meeting to get input from your homeowners and to let them know about this new landscaping option. Showcase xeriscaped yards through a garden tour. Advertise the tour to residents and make it fun community event. Have homeowners present their yards. Incentivize xeriscape yards that meet your aesthetic standards by awarding “Yard of the Month Awards” for water-efficient landscapes. Where they exist, these awards are typically awarded to yards with lavish, water-intensive turf grass. Schedule a time for community members to ask experts all of their xeriscape questions. This may take the form of a monthly meeting or gardening clinic. If your xeriscape contains an alternative turf grass, water deeply (at night) until the grass is established. After it is established, hand water only once a month during growing season if grass looks thirsty. If your xeriscape is composed of succulents such as cacti, no water should be needed once plants are established. Also, very little water is needed to establish the plants. If your xeriscape is a mix of native and drought resistant plants, the plants should rarely be watered. For most of the year, the plants should be self-sufficient. In extreme temperature events and drought in the summer, the plants may be watered when they begin to look thirsty. Water deeply, but seldom. To establish native and drought tolerant plants, water in deeply when you first plant as you would with any other planting. Your xeriscape plants typically grow much more slowly than water intensive plantings, do not overprune or excessively fertilize. Mulch and organic matter in soil retains water for plants. Amend your beds to increase organic matter. However, be aware of specific plants such as cacti that do better in poorer sandy soil. Cap or remove all irrigation systems. It is nearly impossible not to overwater your new landscape if you have an irrigation system.